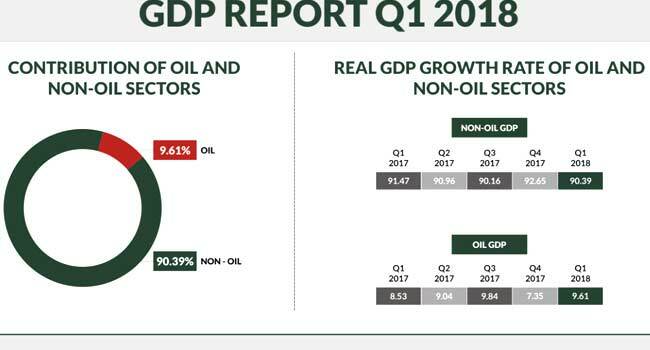 Nigeria’s real Gross Domestic Product (GDP) grew year-on-year to 1.95 percent in the first quarter of 2018. According to the National Bureau of Statistics, the performance represents a stronger growth compared with the first quarter of 2017, indicating an increase of 2.87 percentage points. Compared to the preceding quarter, however, the GDP fell 0.16 percent points from 2.11 percent. The statistics bureau says the GDP number presents a positive year on year nominal growth rate of 9.36 percent.